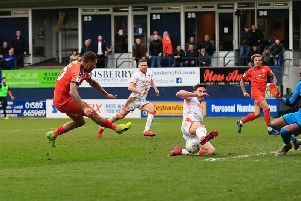 Midfielder Alex Lawless made his 100th appearance for Hatters during their 3-0 win over Alfreton on Saturday, writes Mike Simmonds. The 29-year-old, who signed from York City in November 2010, set up Town’s first two goals, and also had a hand in the third, too. Boss Paul Buckle said: “His versatility has been invaluable this season. “Alex is someone that you don’t have to tell him twice, he’s very disciplined for the team. For all the latest Luton Town FC news, reports, stats, player profiles, live match updates, MOM poll, prediction table and a complete fixture list, visit our Hatters Microsite.